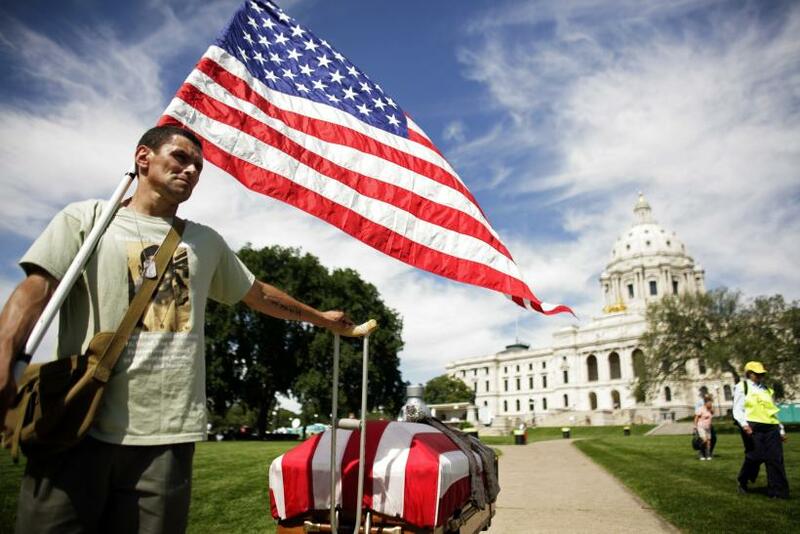 Carlos Arredondo pulls a mock coffin of his son Aleksander, who was killed in Iraq, as he joins other protesters marching toward the venue of the Republican National Convention in St. Paul, Minn., Aug. 31, 2008. Carlos Arredondo is being heralded as a true American hero as the story of how he risked his life to help the victims of the two explosions that rocked the Boston Marathon Monday afternoon spreads around the world. Arredondo, whose cowboy hat and long, dark hair made him easy to spot in many of the videos and photos that emerged in the aftermath of the bombing, seems destined to be one of the faces of the tragedy as word gets out about his heroic acts as folks turn to his story in hope of finding good amid the carnage. When the bombs went off, Arredondo was near the Boylston Street finish line of the marathon, which he was watching in order to support a runner who dedicated his race to Arredondo's son, a U.S. Marine who was killed in the Iraq War, according to the Portland Press-Herald of Maine. Arredondo immediately sprinted into action after the bombs detonated, and he can be seen in videos of the aftermath rushing to one of the two bombing sites, then pulling debris and fencing away from the bloody victims, clearing the way for emergency personnel to tend to their wounds. The 52-year-old is also seen wearing his cowboy hat in one of the most visceral photographs to emerge from the coverage of the bombing, which depicts Arredondo seemingly pinching off the exposed femoral artery of a victim who lost both his legs during the attack as he is escorted from the scene via wheelchair. He also reportedly attempted to stop the bleeding from other victims' injuries and can be seen in another news image holding a bloodied American flag he reportedly recovered from the scene of the explosions. Arredondo has been in the public eye before, as he has been a peace activist since 2004, when his son Lance Cpl. Alexander Arredondo died in Iraq, according to the Daily Mail, which reports that his other son, Brian, committed suicide at the age of 24 on Dec. 19, 2011, after succumbing to depression and drug addiction following the death of his brother. Arredondo, who legally changed his name to Alexander Brian Arredondo in tribute to his sons, immigrated from Costa Rica to the United States and became an American citizen in 2006, according to a blog post by Massachusetts Institute of Technology research assistant Chris Peterson. He also volunteers for the Red Cross, according to the Daily Mail. Twitter has seen a steadily growing flow of tributes to Arredondo, as his name makes its way into the national consciousness. Twitter user @Dbienusa7 tweeted the following words Tuesday evening: "Carlos Arredondo is one hero we all need. #BostonMarathon #Prayers." And Twitter user @mkelley tweeted "reading up on Carlos Arredondo, he jumped in and started rescuing folks. real hero & peace activist." But Twitterer @Mmmmmmmmmmmmmph put it most succinctly in this tweet: "Carlos Arredondo. Hero." Arredondo is surely not the only hero of the Boston Marathon explosions, but he is one of the first to be identified and honored in the hours since the bombs exploded.